Kyle Gabler and Allan Blomquist (who brought us World of Goo), have teamed up with Kyle Gray (Henry Hatsworth in the Puzzling Adventure) to form Tomorrow Corporation, both the development company responsible for Little Inferno, and the name of the in-game corporation that sells the Little Entertainment Fireplace that the player stares at throughout most of the game. Gameplay consists mainly of setting things on fire, watching them burn, earning coins, buying more things to burn, and repeating. It’s very simple to play and understand. So simple in fact that I find it difficult to come up with a strong argument against those who might say that Little Inferno isn’t even a game at all. If it is a game, why is it impossible to lose? Where are the bad guys, the points, and the high scores? True, it doesn’t seem much like a normal video game. Progress through the game is measured by catalogs of items to burn being sequentially unlocked and a steadily increasing supply of coins. Yet somehow, I could not stop playing! I began Little Inferno around 10am and did not stop until I completed it. Surely it qualifies as a game if it held my attention so consistently and for so long. Granted, it’s not a very long game. The whole thing took me less than five hours, and short of watching more things burn, there is little reason to play again. But I still found it to be a highly engaging and rewarding experience. The art style is one of the many reasons that Little Inferno kept me playing. It should be immediately recognizable to anyone that played World of Goo, from the obvious attention grabbers, like the wide eyed characters and creative burnable objects, to the subtleties, like the way the title screen fades to black before the game starts and how the interface is presented. It all feels very familiar, and that is a good thing, as World of Goo was a delight to look at. 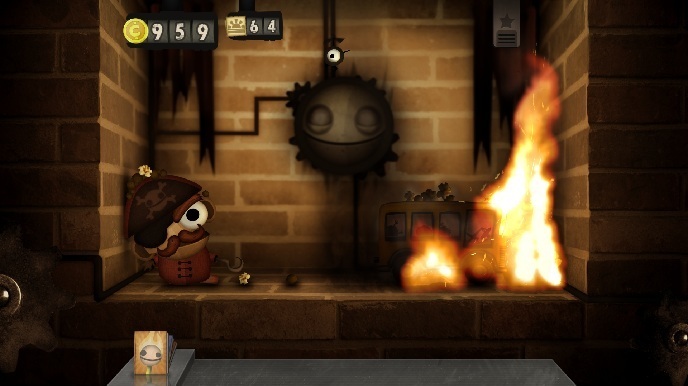 The visual details in Little Inferno come together beautifully. The fire effects steal the show, with flames that grow and shrink based on what fuels the fire. Burning objects are entirely moveable by the player, and often crumble to pieces in a believable physics environment that is very fun to play around with and to look at. The item catalogs are a work of art as well. The pages are filled with creative items, and each item has an entertaining animation and interesting description. When several things are burned simultaneously, they interact seamlessly and realistically, even when the items themselves have no basis in reality. And either by trial and error or by looking at a list of hints, the player can discover burning combos that are sometimes necessary to unlock another catalog. There is a great deal of fun to be had in putting unlikely combinations of objects together in the fire. Most of them will ignite or explode, but there are many less traditional devices (including homages to other games) that can cause a huge variety of other effects when burned, such as shattering, freezing, raining, chemical and electrical reactions, or even good old fashioned slicing and dicing. The physics engine covers far more than fire. The developers did a fantastic job with the sound effects as well, adding to the overall satisfying nature of guiltlessly burning things. The background music is both suitable and effective on an emotional level. And speaking of emotions, Little Inferno succeeds at storytelling in a way that might be unexpected from a game that seems to be little more than a fireplace simulator. Like World of Goo, which told its story mostly through unspoken text written on signs by an unseen character, much of the story in Little Inferno is presented via typed letters. I won’t go into detail as it would be a shame to spoil such a story, but I just want to say that I consider the writing to be one of the developer’s biggest accomplishments. This is a game that is very much worth finishing, and which connects emotionally. All I really have to criticize is the lack of replay value in an already short game. With an MSRP of $14.99, it’s a lot to ask for such a brief experience. But it’s always the good games that leave you wanting more, isn’t it? Little Inferno is one of this year’s IGF finalists. I wish the team at Tomorrow Corporation the best of luck and congratulate them for what they have accomplished with this innovative game. Ari did not receive a copy of the game for review purposes. -No options menu of any kind (it could use a frame rate limiter). -The game has little replay value and is too short.